Book Review: Unearthly by Cynthia Hand - Book.Blog.Bake. I haven’t had much experience with angel books, but the little experience I’ve had has not left me with a whole lot of confidence in books that carry that label, which is why Unearthly was such a breath of fresh air. The angel mythology in Unearthly is definitely a new twist, but retains enough roots that it’s still recognizable. And the angels in this book are actually useful, not just humans with wings, which is nice. Clara was a pretty great main character for the most part. I liked her, even when her flaws were shining through. She’s angelic, so she KNOWS she has a mission from God and she struggles with balancing that against other teenage predicaments. She’s far from perfect, and she has a tendency to be a bit self-absorbed, which other characters are quick to call her out on. However, she’s still a teenage angel I’d want on my side. Clara’s entire family is a really heart-warming portrayal in YA. There’s some sibling stuff with her brother, and Clara and her mom are pretty close, though they have quite a few disagreements as Clara tries to sort out her purpose. The plot was well-paced and fairly interesting, with a few surprises here and there that I didn’t see coming. It wasn’t the most tightly woven plot or the most exciting in some places, but overall I was interested in the book, and if anything, this was the biggest weak point in the novel, which is a pretty good indicator to how GOOD the book was overall. And perhaps the best part of reading Unearthly is that I finally understand why people love the Christian/Clara/Tucker love triangle so much. It seems like every time I read a review for the Unearthly series, bloggers LOVE this triangle, even bloggers who typically loathe triangles, which naturally made me curious. And I think the love triangle in Unearthly is a love triangle in the best possible way: It shows two sides of Clara, and her dueling with herself between the two. While it’s nice to not have a bad boy/good boy love triangle and I think BOTH love interest are pretty good male characters, I have to say at this point I’m rooting for Tucker, which should again point to Hand’s writing ability since I try to stay far away from cowboys and country boys as much as possible(I’m from Texas–I’m over the cowboys), so for me to actually root for one says quite a bit. Final Impression: As far as I have found, Unearthly really is the best YA Angel book available. 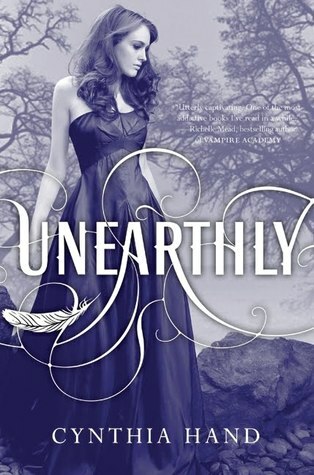 I’m excited to read the sequels, but even without the knowledge of a series, Unearthly has interesting and likable characters, a well-placed plot, and a love triangle I actually really enjoyed. 4/5 cupcakes. I’m so happy you liked this one! Be prepared to be absolutely devastated with the next one – Hand is one cruel lady I tell ya! I’ve read Hallowed, and yup, devastated. . . but also my favorite so far. Such a difficult book(emotion-wise), but so, so worth it. The Sunday Wrap-Up! (17) - Book.Blog.Bake. I can easily say Unearthly is the best YA Angel book I’ve read so far! I haven’t continued the series yet, but I am excited to do so. The characters and the story are interesting, and while I’m usually not a big fan of love triangles this one isn’t too bad! I hope you and I continue to enjoy the rest of the series! Become Blogger of the Week! Right back at you! As far as Angel books go, I definitely think this one’s the best. One of my favorite series ! it just gets better. Read the rest of the series. like now! great review. I’ve read Hallowed and loved it EVEN more. I just have to find Boundless now! Ooh, I’m definitely Team Tucker too! Which is saying something. Cowboys=not typically my thing. Thanks! And I’d definitely recommend this one. I think I like it because unlike most angel YA, it’s not a take on fallen angels–it’s just an interesting angel mythology. It really is completely refreshing in a market that tends heavily towards fallen angels–I’m really glad Cynthia Hand didn’t go that route!